Mt. 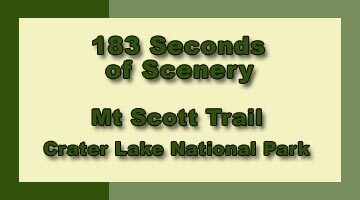 Scott Crater Lake National Park - Explore! Mt. 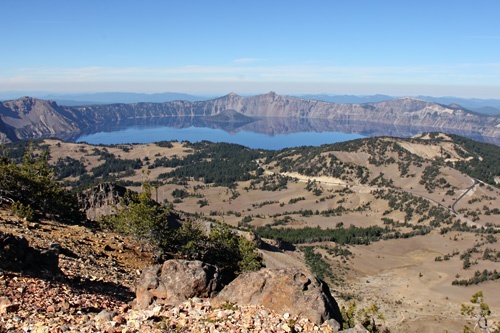 Scott Crater Lake National Park - Explore! Hiking the Mt. Scott Trail . . .
Mt. 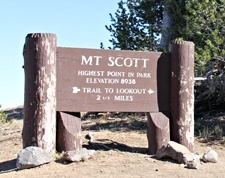 Scott, the tenth tallest peak in the Oregon Cascade Mountains, was named after Levi Scott (1797 – 1890), a prominent politician in the Oregon Territory and an explorer that helped lay out the Applegate Trail, a southern route for the last leg of the Oregon Trail designed to avoid the dangers of the Columbia River route. Scott also founded the town of Scottsburg, Oregon. 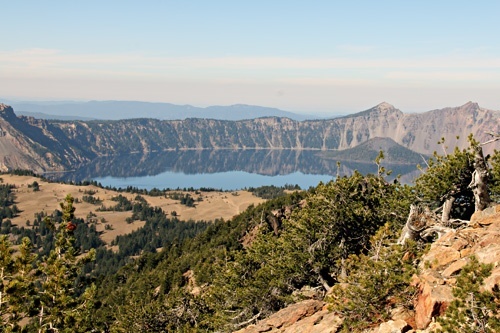 The highest point in Crater Lake National Park is 8,929 feet (2,721 meters) at the peak of Mt. Scott. 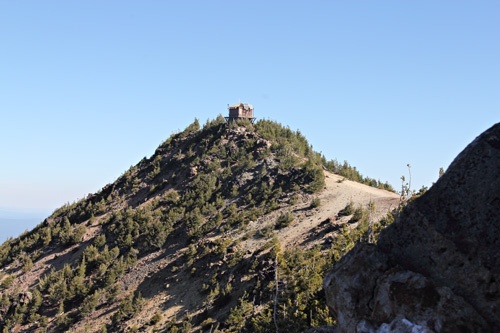 Because the trailhead along East Rim Road is at about 7,700 feet, the climb is not as difficult as you might imagine. For almost a half million years, ancient Mt. 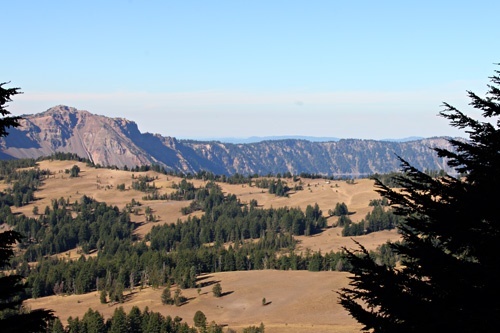 Mazama grew larger through periodic eruptions from various adjacent volcanoes, eventually reaching about 12,000 feet in elevation. The first of this family of volcanoes is believed to be Mt. Scott. It first erupted about 420,000 years ago – about 20,000 years before the next oldest rocks in the vicinity. Those younger rocks are found in the Phantom Ship and its related formation. Long before Mt. 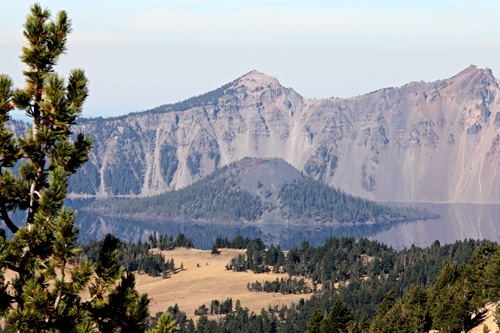 Mazama exploded to form Crater Lake, Mt. Scott was being carved by sheets of glacial ice forming the huge cirque that can be seen from the trailhead and in the header photo above. The graphic above displays the form of the mountain with the cirque carved out to the northwest. By the time Mt. Mazama made its final eruption it had outgrown Mt. Scott’s 8,929 feet and had engulfed much of its sibling. When Mt. 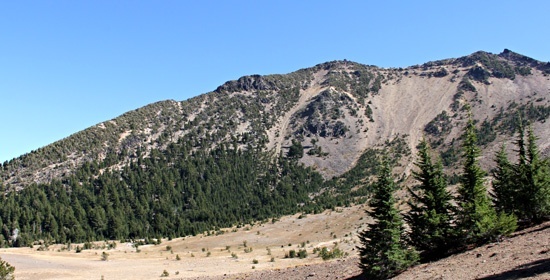 Mazama exploded 7,700 years ago, pyroclastic flows streamed over Mt. Scott and it was showered with pumice and ash. Erosion since then leaves us with the mountain we see today. 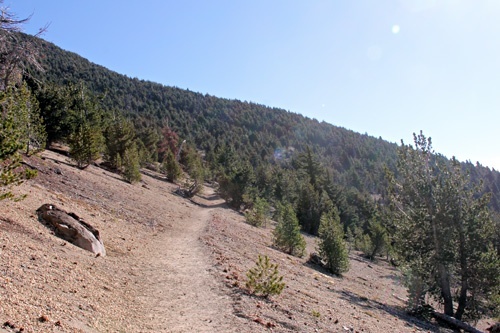 The 2.5 mile trail begins at the trailhead parking area on the East Rim Road about 11 miles from Park Headquarters. 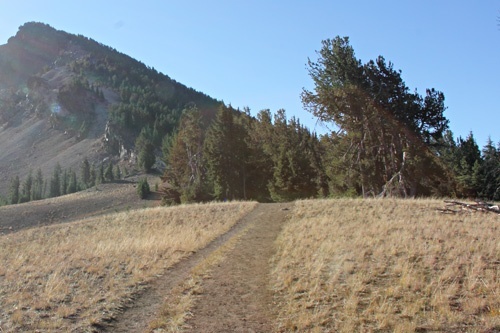 For about a quarter mile, the trail follows an old road over the rolling pumice then begins its climb along the southwest ridge of the glacial cirque that forms the northwest side of the mountain. It climbs into a forest of mountain hemlock, whitebark pine and Shasta red fir. It then moves onto the south pumice slope of the mountain and switchbacks its way almost to the top ridge of Mt. Scott where it breaks over the ridge to overlook the cirque. 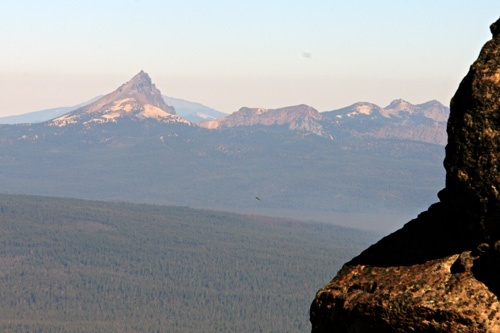 From there it follows the, fairly level, summit ridge to its highest point at the fire lookout. The steepest part of the climb is through the switchbacks about three-quarters of a mile up the ridge. Due to the switchbacks, this section of the trail is not unusually steep for the Cascade Mountains. Nonetheless, most people will be huffing and puffing their way up – especially in the heat of summer. 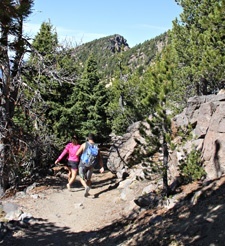 The trail is known for its fabulous displays of alpine wildflowers. However, when we visited in October, there were no wildflowers to enjoy. The best time to see the wildflower display is in July after the snow leaves the trail. If you want to see wildflowers without the climb or at another time of the year, check out our article on Crater Lake wildflowers. Without the wildflowers, it is only the spectacular scenery that makes this one of the most beautiful trails in the world. The first view one gets is of Mt. Scott itself. It presents its huge cirque even to those that simply drive by. 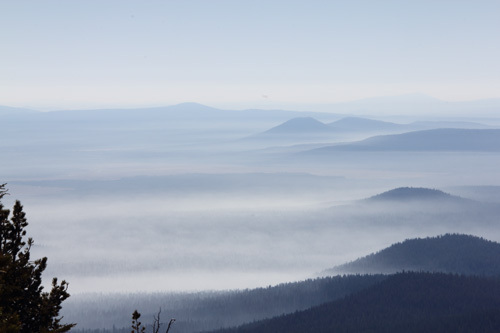 As one climbs along the trail, views to the south reveal the Upper Klamath Basin, Klamath Lake, Mt. McLaughlin and even Mt. Shasta on a clear day. 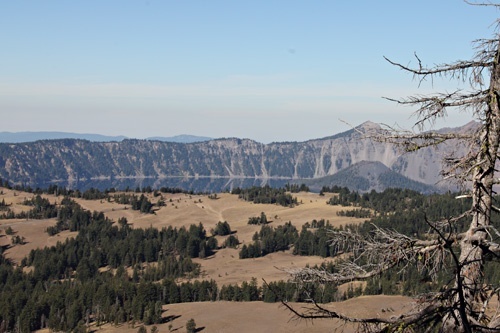 As one climbs the mountain, southerly parts of Crater Lake are revealed to the west, with more of the lake being revealed as elevation is gained until the entire lake becomes the focus upon reaching the summit ridge. One of the switchbacks on the trail also gives a great view to the east revealing a string of smaller mountains into the distance. Our video and the slide show that follows will give you a good feel for the trail and the views from it. You can see a higher resolution version of the video on our YouTube Channel. Hiking Mt. Scott is normally limited to the snow-free months of July through October, but depending upon the previous winter’s snowfall the trail might be clear earlier or later. Snow often closes park roads in October, so the season can end earlier too. On the day we visited, there was an inversion in place. 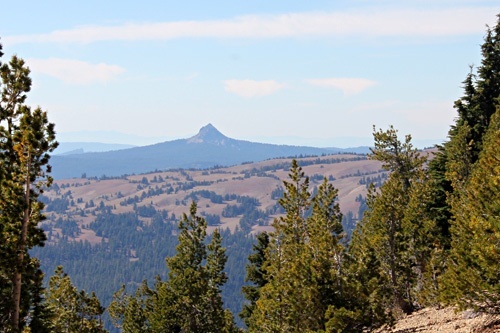 The temperature in the park was significantly warmer than at the floor of the Klamath Basin (4000 feet). Park skies were clear while lower elevations were cloaked in clouds as the view to the east displays in the slideshow below. Also on the day we visited a wildfire was burning just to the north of Mt. Scott . It was contributing significant smoke to the air at lower elevations. 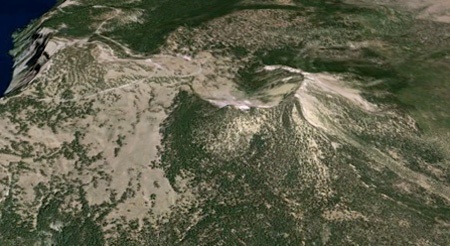 The aerial graphic of Mt Scott is courtesy of Google Maps. All other photos, text and video were produced by Jerry Haugen, Pathfinder and are ©2014 Global Creations LLC, all rights reserved.